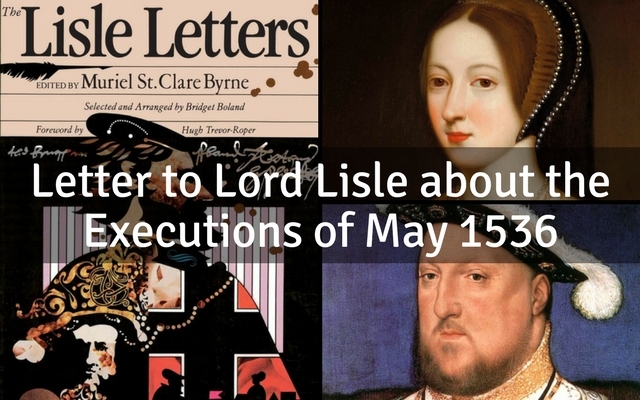 A letter regarding the executions that occurred in May 1536 is not uncommon. This letter was written by John Husee who was best known as the personal agent of Arthur Plantagenet, Lord Lisle. If you are not familiar with who Lord Lisle was then you should know that he was the illegitimate son of King Edward IV – this made him uncle to Henry VIII. Lisle was governor of Calais from 1533-1540. The execution of Anne Boleyn and the other innocent victims was well-known. This letter is written as fact with no opinion attached. One was not allowed to speak against the king and so unable to voice an opinion, especially in writing – where your words could be interceded by a member or spy of Henry’s court. Pleaseth your lordship to be advertised that I have received your letter, with the spurs; and notwithstanding that I have waited diligently, and made all the friendship that I can make, I can hitherto find no ways to come to the King’s presence. His Grace came not abroad (except it were in the garden, and in his boat at night, at which times it may become no man to prevent him) these xxiij days. So that I have been, and yet am, at a bay. I trust ere it be long, seeing that these matters of execution are past, to speak with his Grace, and then deliver your spurs according to your lordship’s writing. The Lord Rochford, Mr. Norris, Brereton, Weston and Markes suffered with the axe upon the scaffold at Tower Hill on Wednesday the xvijth of this instant, which died very charitably. And Anne the late Queen suffered with sword this day, within the Tower, upon a new scaffold; and died boldly. Jesu take them to his mercy if it be his will. Your hosen shall be sent within this vj days. And touching Mr. Page and Mr. Wyat, they remain still in the Tower. What shall become of them, God knowest best. The most part of the late Queen’s servants be set at liberty to seek service at pleasure. Mr. Aylmer shall show your lordship something by mouth which I will not now write. And thus I beseech Jesus send your lordship once a quiet living to your most noble heart’s contention. I can yet get no answer concerning the friar. The news that Husee said, “Mr. Aylmer shall show your lordship something by mouth which I will not now write” is in reference to the King’s marriage to Jane Seymour. The day after Anne’s execution Henry was formally betrothed to Jane.